In honor of this Saturday’s upcoming CAIR-OH banquet, I thought it appropriate to revisit this week some of CAIR-OH’s previous keynote speakers and events since last year’s banquet. Today we remember 1999 speaker, convicted terrorist leader Abdurahman Alamoudi, a founding CAIR board member. Alamoudi was convicted in 2004 and sentenced to 23 years in prison for his terrorist activities. According to the US government, Alamoudi was Osama bin Laden’s point man in the US, and was used by bin Laden as a conduit to funnel money to “blink sheikh” Omar Abdel-Rahman (currently serving life in prison for his involvement in planning the 1993 World Trade Center bombing and plotting other terrorist attacks inside the US). Amoudi’s name surfaced almost a decade ago when federal agents grabbed the blind sheik and several other suspects as they were literally mixing a “witches brew” of explosives in Queens to detonate bridges, tunnels and landmarks in the Big Apple, a knowledgeable source said. Among those arrested was Abdel al-Rahman Haggag, the sheik’s speechwriter, who turned government informant. Haggag said he believed Osama bin Laden routinely funneled $5,000 payments to Rahman through Amoudi and his organization, the American Muslim Council. Bin Laden’s funds were allegedly used to pay Rahman’s rent and phone bills in New Jersey and Brooklyn, a source said. So Alamoudi’s involvement with bin Laden was what initially put bin Laden on the US terror radar. In the next century, American Muslims will (inshallah) take their proper place in this society. The Muslim voice must be heard at every level and on every issue of importance, both domestic and foreign. Grassroots support for national and regional Muslim organizations is a key to the community’s success. The past year saw a new culture of activism being born in our community. CAIR Ohio has been working on promoting balanced and correct understanding of Islam and Muslims, defending Muslims’ rights and making a difference. . . Hear that, Bill Clinton, we are all supporters of Hamas, Allahu Akbar. [Crowd responds]. How nice. Both HAMAS and Hezbollah were designated terrorist organizations in 1995 by the US government. Just a few months after that in January 2001, Alamoudi put in an appearance at the “First Conference on Jerusalem” in Beirut. Also in attendance were representatives of Al-Qaeda, Egyptian Islamic Jihad, HAMAS, Hezbollah, and terrorist leaders from all over the Middle East. The picture below shows Alamoudi (second from left) at the Beirut conference with current HAMAS spokesman Ahmed Yousef (far left; recently noted here as local Columbus resident Anisa Abd El Fattah’s coauthor), Yaser Bushnaq, and Imad-ad-Dean Ahmad. The participants included leaders of Usama bin Laden’s Al Qaeda terror group, Hamas, Islamic Jihad, Hezbollah, and militants from Egypt, Pakistan, Jordan, Qatar, Yemen, the Sudan and Algeria. Sources say at least one participant went to the conference from the United States and returned to the country afterward. U.S. intelligence sources have identified two leaders of the Beirut-based Jerusalem Project. On Aug. 11, Amoudi was stopped in England at Heathrow Airport with 34 bundles of sequentially numbered $100 bills in his suitcase as he prepared to fly to Syria. He said he received the money from Libyan officials to try to win release of Libyan assets frozen after the 1988 Pan Am bombing. But U.S. Immigration and Customs Enforcement Special Agent Brett Gentrup said in court documents yesterday the feds suspect Amoudi might have been funneling the $340,000 to terror groups operating in Syria, such as Hamas and the Palestinian Islamic Jihad. Gentrup also said a transcript had been uncovered in which Amoudi criticized al Qaeda’s selection of terror targets. Amoudi said too many Muslims were killed in attacks such as the 1998 Kenyan embassy bombing, the court documents claimed. “I prefer to hit a Zionist target in America or Europe or elsewhere,” Amoudi said, according to the court documents. Yes, he complained that Al-Qaeda attacks were killing too many Muslims and not enough Americans. As noted by the Washington Post, Alamoudi pled guilty and confessed to his crimes. 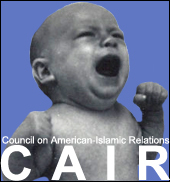 CAIR-OH, however, has not said a word in response to the terrorist activities of their previous annual fundraising banquet keynote speaker. Thanks to Ahmad Al-Akhras and everyone associated with CAIR-OH for bringing this terrorist leader into our community!